Plantar fasciitis is a painful condition of the foot causing pain under the heel. Plantar fasciitis exercises should form an important part of a treatment and rehabilitation program, especially stretches for the plantar fascia or the arch of the foot. Ultimately, getting rid of plantar fasciitis long-term means stretching the plantar fascia so it does not put additional strain on the insertion to the heel. Below we outline a few simple exercises which should be done pain-free and in conjunction with other treatment options including foot massage. One way the plantar fascia can be stretched is by pulling up on the foot and toes with the hands. Hold the stretch for about 30 seconds. Repeat this stretch 5 times and aim to stretch 3 times a day. It takes discipline to stretch regularly, but it is very important that plantar fasciitis exercises are being done regularly until the pain goes, and even for a time afterward. The night splint is a splint is worn overnight, although can be applied for shorter periods during the day. It compliments plantar fasciitis exercises by preventing the tissues from tightening up overnight. Some people may find them uncomfortable to wear, but if you can gradually increase the wearing time each night then the results can be worth it. Wearing a night splint is more effective than plantar fasciitis stretches alone. 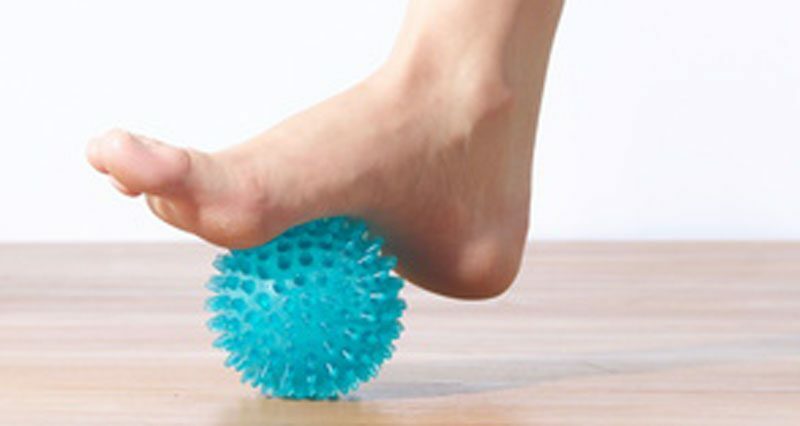 The plantar fascia can be stretched by rolling the foot over a round object such as a ball, weights bar, rolling pin or can of soup (or similar). Roll the foot repeatedly over the object, applying increasing downward pressure. Using an object which can be cooled in the freezer, such as a bottle or metal can, also applies cold therapy at the same time! This should be continued for 10 minutes per day until you can walk pain-free in the mornings. Place the leg to be stretched behind and lean forward, ensuring the heel is kept in contact with the floor at all times. Hold the stretch for 20 to 30 seconds and repeat 3 times. This can be repeated several times a day and should not be painful. A stretch should be felt at the back of the lower leg. If not, then move the back leg further back. A more advanced version of a calf stretch is to use a step and drop the heel down off it. To stretch the soleus muscle the back leg should be bent. Place the leg to be stretched behind and lean against a wall, keeping the heel down. A stretch should be felt lower down nearer the ankle at the back of the leg. If this stretch is not felt then a more advanced version is to place the forefoot of the front leg against the wall with the heel on the floor and push from the knee towards the wall. Hold for 15-20 seconds. This should be performed with the knee straight and then repeated with the knee bent to make sure you are stretching both muscles. You should feel a gentle stretch. Be careful not to over-do this one. Strengthening exercises are not usually necessary for the treatment of plantar fasciitis. The athlete is more likely to go straight back to a gradual increase in running or sports specific training. However, scrunching up a towel with your toes or picking up a pencil with the toes are both examples of exercises to strengthen the plantar fascia under the foot.